For weeks or maybe months, I’ve been revising old posts and sticking them to the front page, to bring them to the attention of my readers. This is essential because my website and blog have been around for years, and have gone through a few format changes. So there are hundreds of posts and pages, on various subjects, but the older ones are full of formatting issues. Also, in the “olden” days I tended to write super-long paragraphs, which needed splitting for online readers. A screen is not like a book…. I don’t have 16 hours a day to spend fixing the formatting, so instead I can do it one post/page at a time. Slowly but surely, my pages and posts are looking sleek, with lots of white space, no weird formatting, and updated links. I don’t feel that way anymore. I don’t connect with the grief-filled posts, except in memory. Even the anger has tempered somewhat. I have no fear of Richard and Tracy. It’s just a reminder of how I once felt. It’s amazing how far I’ve come since those posts were written. And I can thank blogging for that. It really does help heal. So the reason for revising and reposting them, is all about the writing now. It’s about polishing up the posts to make them more readable, and increasing their visibility through links to other blogs. Because out there are thousands of people in the same spot I was two years ago, or three years ago, looking for stories like mine to help them along the way. Perseverating on the abuse and feeling like I can’t move on, is in the past now. It’s moving forward–but with all sorts of back-material which can still help many readers. And I see them coming in all the time, along with the occasional subscriber. At the time of Beltane, near dusk, Goewin, daughter of Duncan, a young bard, sat on a tree stump to play her flute. She was a fair maiden with golden hair and sky-blue eyes, and driven to play music on her whistle. But, though certainly not destined to be a king, she had been given a personal geas by a druid, the seer who foretold her musical ability when she was born: She was not to play any song that would make herself cry. Because of this, she was known throughout the land for her cheerful music and jigs, and never played sad songs. Three heads hanging from his horse. As he alighted from his horse. And therefore lost his head. “There was great rejoicing when he died. –And there Goewin stopped. She couldn’t think of how to go on, so she decided to wander around the fields and wait for inspiration. In a wood, she saw a small shape flitting around. Curiosity overcame her, and she followed it to discover what it was. The shape disappeared near a fairy mound. Goewin had never seen such a mound before. She’d heard about them, but with her mind so full of her poem, she didn’t recognize what this was. A blackbird flew over and perched atop the sidhe (fairy mound). Goewin said to it, “Is this mound meant to give me my song?” It began to sing, which she took as a sign. She sat beside the bird, which didn’t fly away, and began to play and to work on her song. As she played, a beautiful, tiny young woman appeared before her. She had slanted eyebrows and eyes, eyes of blue-green, a pointy nose and a small mouth. Her hair hung in red-gold spirals. A golden torque was around her neck, and her dress looked as if made of silken leaves. “Within the sidhe?” Goewin cried, finally recognizing the fairy mound. Then hands reached from behind her and grabbed her. The fairies carried her off and into the sidhe–their home. So Goewin entered part of the glorious realms of the Otherworld. At first she was frightened, but the fairies made her feel at home. Elva, the beautiful elf with the red-gold hair, being the daughter of the king of the elves, gave her the title of chief bard to the fairies. Goewin played for them as they desired; her happy and beautiful songs delighted them. They had her play as often as she could without getting a sore throat or a light head, and nursed her throat so she could sing for them as well. Fed by fairies, nursed by nixies. The wonders of the Otherworld. They flit here and there and sing with my flute. Green, fertile fields that know no blight. No sweeter song than the ones the gate-tree hums to you. Gives you shade from a sun of gold. And at night, a silver moon shines. At the east, the west, the north and the south. It shines on fairy feasts and dancing. With wine, pork, mutton and bread. They give me jeweled torques with gold and red gold, laurels for my head, a gold branch for my hand. Little lights leaping in the moonlight. An elfin poet named Brí, son of the chieftain Bran, soon caught Goewin’s eye–a goodly youth with hair like flax and eyes of sea green, a long nose, and muscular arms; tall for an elf, but not gawky. His eye was keen like that of the eagle that perched on his shoulder, little Craig as he called it. Brí wore a leaf tunic, leather shoes and a magnificent tuigen (poet’s mantle)–the lower part made of swan skins, the neck of a swan hanging down from the collar and down the back. 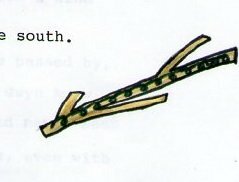 In his hand he carried a gold branch. Though Goewin’s own tuigen was made all of swan and her dress was made of the finest silk leaves, this tuigen made her eyes widen. Here was a chief poet, worthy of her; whenever she saw him, her songs turned to love ballads. She hoped to work a kind of love charm on him through her music. One day, Goewin saw Elva gaze after Brí when he passed by, and heard a sigh that showed she loved him, too. Goewin knew it would be risky to compete with Elva, but she had never seen so worthy a youth as Brí. She would fight for him, even with the daughter of the king of the elves. Elva soon realized she had a rival, and that her rival was preferred. This enraged her. One evening at a feast, as Goewin played and the fairies danced, Goewin began singing a love song. It described Brí, though it did not name him. Brí recognized himself in it, and danced over to her. After the song, he kissed her. “No one, mortal or fairy, will do such a thing to my daughter,” King Aubrey said. 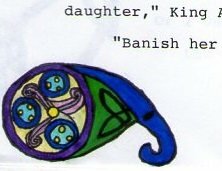 “Banish her forever from the sidhe, father!” Elva said. He called over a black horse, which carried Goewin out of the sidhe and dropped her onto the ground. She began to sob when she saw the horse disappear into the mound, and the entrance hide itself from her. Her silken clothes turned to the frock she’d worn before entering the sidhe. Her head and throat ached with tears. She found her way back home, and discovered that what had been months to her, were centuries to her people. Her family and friends had long since died and turned to dust. She ran back to the mound, all alone in the world, separate from Brí and even from the world of the sidhe. All my life has gone with them. I can look, but never find them. I’ve seen their tombs. My house is crumbled. The people have all forgotten me. Goewin daughter of Duncan, who is she? they say. My cheerful, charming melodies have not survived. I am the chief poet of the elves! Or I was. And my songs have gone with the wind to the Cailleach. Oh, the agony of being forgotten as if I’d never been. My love is exiled from me. For trees that hum my tunes. And here a tear fell from Goewin’s eye. Thus Goewin daughter of Duncan broke her geas, and died. Her body lay over the mound, and Brí carried it off to bury it. Elva felt terrible about her death, and allowed the fairies of the sidhe to mourn for her. In time, Brí forgave her because of her abject heart, and after a year they married. Nyssa, answering your inquiry about how I used to see you. For a long time you were very quiet and never said anything. You sat with all of us at meals but you never joined in the conversations. We didn’t really know you. You were a part of the group, but you were a stranger for a long time. I asked you to room with me this year for a reason. I didn’t know you and I could tell there was an extremely interesting person in that shy, reserved exterior. And I was right. You talk so much more than you used to. You are a completely different person than I had once thought. I love the ‘you’ that I have gotten to know this past year. Meeting the real ‘you’ has been one of the highlights of my year 🙂 . I didn’t mean to make you doubt yourself or the way you see yourself now or in the past. You really didn’t talk to me as much as you talked to Pearl (and Cindy when you lived in Krueger). You did talk a lot when you were with one person, but I usually saw you with the “group” and you really didn’t say much. But that’s not bad. Usually I don’t say much in the midst of a large conversation. I just can’t keep up and my mind goes blank. I was the only one in the apartment with a Winterim class. Sharon and Pearl were probably working at their work-study jobs, giving them an excuse to stay in the apartment during Winterim. Tara had an internship, and also stayed in the apartment. For me, the studying wasn’t at all bad, though, because I enjoyed the Celtic Roots class. I think I often read the chapters at work in the morning. In the afternoon, I practiced playing the tin whistle while my friends were out of the room. Yes, studying the tin whistle was part of the class, since Dr. Bard, the teacher, played French folk music with his wife. They even played at the campus Open Mike and at gigs around the area. Dr. Bard, a 30ish, social science teacher with glasses, had red hair and a beard, and combed his hair down over a bald spot to look like bangs. We had two textbooks, little paperbacks. The Celts by Nora Chadwick was one. The class and even the teacher agreed that this, though informative, was very dry. Still, I found it useful when writing my novel Tojet. We liked The Elements of The Celtic Tradition by Caitlin Matthews a lot better. It was a fun book, going into the religion of the Celts, from pagan days to after they converted to Christianity. She, a Druid, included exercises in the back of the book for such things as finding your totem or your destiny through meditations. But in the rest of the book I noticed no bias for or against any religion. Helene and Catherine had Celtic class along with me, and I would usually sit between them. The class was held in the Honors classroom, room number 24 in Old Main. We had a lot of fun in that class, and would talk about it afterwards. It seemed everyone in the class had a good time. When the course ended, Dr. Bard asked how many of us would continue to play our tin whistles. Most of us raised our hands, including me. However, though I still have the music sheets we used, along with sheets showing examples of knotwork, I haven’t played my tin whistle since 1998. This class helped me get over Phil by giving me something fun to do that wouldn’t remind me of him, and by proving I didn’t need him to have a good life. One day, in fact, Catherine and I and maybe Helene went to check mail in the Campus Center, as we did every day (though I, of course, couldn’t check mine there anymore). We took out our tin whistles and practiced a particularly challenging and beautiful tune, which we learned in class that day. The door to the Pub was across from the mailboxes, so I happened to see that Phil was in the Pub. I hoped he’d see and hear us, that he’d realize I moved on and was now doing new and interesting things. I wanted him surprised to see me standing there playing a tin whistle. I wanted him to think he’d lost a talented, imaginative, and intelligent person, and would never get her back again. 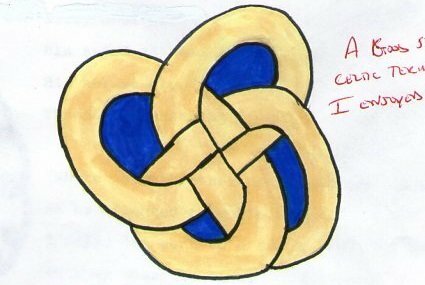 On probably the 18th or 19th of January, Dr. Bard taught us how to draw Celtic knotwork. Mine wasn’t very good, but during class I began to practice. During the lectures and while we listened to various types of modern Celtic music, I drew knotwork all over my plain Roanoke folder (which was my Winterim folder) and colored it with my yellow highlighter. At night, I filled in the knotwork with other colors as well, using a set of markers. 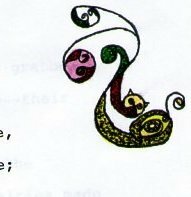 I drew spirals, knotwork, snakes and torques, and I even filled in various letters and other things with the highlighter. In the end, it was a folder to be proud of. Of course, by then I was probably done with the course, so I used it for other things. We sometimes listened to old- or new-fashioned Celtic music in class. When we did, there was little else for us to do except listen. Helene said to me once, “Dr. Bard should notice how uncomfortable people get during the music, and maybe play it in the background while we’re doing other things.” We liked the music, but it would be more pleasant to listen to it that way. At least several people in the class were Christians like us. One girl, however, was vehemently anti-Christian. She was bad-tempered and seemed to like nothing better than to sit there and rip on Christians. She spoke of a Christian couple who used to live next door to her when she was a child, and treated her awfully. We Christians wondered what they had done to her, and wished she’d realize that one couple did not represent all Christians or Christianity. When a group of Wiccans spoke to the class, she was intrigued and asked many questions. But religion should not be about running away from or rebelling against another religion. It should be about true beliefs. We learned about the head-cult of the Celts, that they displayed the heads of defeated enemies and sometimes even drank out of their skulls. Dr. Bard also told us that the one who came late to a revel (or meeting?) got his head chopped off. I looked at Catherine, and we joked that if we lived back then, we would be dead before we reached age 21. I drew a stick-figure cartoon about this: First there were the feasters, then some guy came late and got his head chopped off, and then the feasters went back to their revel. I wish I could find it now. On the 16th, three speakers explained to us the modern-day Wiccan religion as it relates to the Celtic nature religions. I wasn’t sure what to think about them at first because at least one of them wore a black T-shirt and an upright pentacle on a chain around his neck. This one also had long, dark hair, and looked to be no older than his 20s or 30s. They gave fascinating information about Neo-Pagans and their beliefs, and how Celtic nature religions fit into the Middle Ages. The class took notes. The speakers said the Church Christianized certain holidays to help keep new, formerly pagan converts from turning back to their old ways. Now, since then, I’ve heard various theories about why holidays and pagan deities were Christianized. This is one; another is that the pagans-turned-Christians themselves made deities into saints and pagan holidays into Christian ones because they didn’t want to give up their beliefs. Another view is that the Christian missionaries were wise and adaptable in incorporating the local festivals rather than just forbidding them. And, of course, a view you commonly hear is that the Christian church just wanted to steal everybody else’s religious practices. I reject that view wholeheartedly. See here for more information. The speakers said some Wiccans, like them, actually believe in both Christianity and Wicca, and are called Christian Wiccans. They also explained some of the magic they use, that it’s a science, that it isn’t always so much casting a spell as it is positive thinking and changing yourself to get what you want, just as a businessperson might wear power suits to be more successful. They also explained other kinds of magic that actually used spells and the powers of creation. They said love spells weren’t charms, but learning how to change yourself and your traits to be more attractive to the person you love, so he/she will want to date you. One of the traditional students, a girl, her religion unknown to me, said, “But if you have to change yourself to be more attractive to this person, aren’t you better off finding someone else who appreciates you the way you are?” She was right, of course, though I don’t remember what, if anything, the speakers said in reply. One day, on Catherine’s request, a friend of hers from the SCA, Ayesha, came to speak to the class. (I can use her name because she has long since passed away.) She was about 35, with short, dark hair. I’d just heard about the SCA, or Society for Creative Anachronisms, a medieval re-creation group, over Christmas. A couple met in the South Bend SCA group, then the Shire of White Waters, and had an SCA wedding ceremony. The South Bend Tribune ran an article about it. I thought the SCA sounded neat. Though my friends apparently knew all along, I had no idea that Catherine used to go to SCA meetings when we were freshmen. Ayesha was a member of the Catherine’s group, which I later discovered was a certain shire, based in S– and M–. After Ayesha spoke to the class, I went with Catherine as she helped Ayesha take her speech props back to her car in the Jubilee parking lot. They tried to talk me into joining the SCA, and I thought about giving it a shot. Catherine told me there were “hot guys in the SCA, and they love to flirt with you.” This attracted me: Now that several months had passed since the breakup, the Vampire train had derailed, and neither of my crushes were interested, I felt ready to find a new man or two. She said the meetings would suit me because they were always late and laid-back. They’d go on for hours, constantly getting sidetracked, and then someone would say, “Hey, isn’t Star Trek:TNG on?” and turn it on. These SCA people were also like Catherine and loved to hug. I wrote a story for my presentation, which was in place of a final. 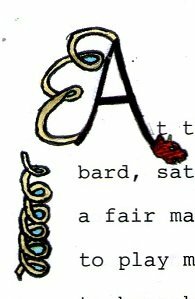 I sat down with paper and my Iona (Christian Celtic) tapes, made a list of Celtic names I found, and wrote a story about a girl named Gwyn Duncan. I thought Gwyn was a girl’s name, but later found out it was probably male. The story was short and simple, with a few sets of lyrics and a typically Celtic, unhappy ending. It was about a girl taken by the sidhe, or fairies. It took a few hours to finish, and once started and put into a Celtic mood by Iona, I didn’t want to break the spell for anything. Here it is, including my pictures. I later revised the story, typed it up, and decorated it with various Celtic-style pictures. I read it in class on the 27th. As I read, I tried to forget myself and just read, because if I remembered I was reading in front of a classroom full of students I’d get nervous and self-conscious. When I finished I passed it around before giving it to the teacher, so everyone could see the pictures. I didn’t know what people would think of my story, and feared they’d think it was stupid, but this wasn’t the case at all. Helene complimented me on it and its simplicity, though she didn’t like Brì marrying Elva at the end. I think one reason for the sad ending was my own cynicism about love at the time. Another reason was to make it seem more Celtic, since Celtic stories were typically depressing. I’ve made a few minor changes: Gwyn Duncan became Goewin daughter of Duncan, the tin whistle became a flute–basically, grammar fixes and things which fit better historically. I also added short definitions, since the story was originally written for a class familiar with the Celtic terms. One of the non-trad women in the class made a variety of Celtic foods for her presentation. She feared she hadn’t made them right, but I told her they were delicious. There were different types of breads, including one that was called barmbrak or something like that, and there may have been other kinds of food as well. Remember the girl who detested Christians? She did a Celtic pre-battle ritual. She even passed around a real, human skull full of sparkling grape juice. She said it was clean, but I passed it on without drinking from it. Ewww! Catherine and Helene also took a pass. But Dr. Bard took a big swig. Brigitte did her presentation on her clan’s history (she had a Scottish last name). She discovered that it was related to Kenneth MacAlpine. After class I told her we were probably related, because my own ancestry goes back to MacAlpine through Duncan I. Some people said Brigitte had a crush on James, whom she knew from Circle K. James was sure popular that year! He wasn’t a handsome stud, either, so you can’t blame it on that. Some men don’t have to be handsome to be desirable. I heard that she was amusingly obvious about her crush, and asked James to take her places all the time. She succeeded, and the latest Roanoke alumni book shows that James married her and moved to Green Bay. Dr. Bard showed us beautiful medallions his mother made, which were painted with figures of Matthew, Mark, Luke and John from the Book of Kells. They had metal loops at the back so they could be strung onto necklaces. He told us we could buy them for about $3 (if I remember correctly).